"We have prepared some features, that will let you multitask more easily, and customize your browsing experience to make it even better. Opera 56 is the best browser for multitaskers, and might just be the ideal one to suit your needs. Volume control for the improved video pop out player makes Opera 56 perfect for balancing work with entertainment. In addition, we have added the page zoom indicator in the address and search bar, and have tidied up the settings and About Opera pages. New options in settings for the scroll to the top of the page feature, and sponsored content are available too. Finally, Windows and Linux users have a quicker way to report any bugs, or issues in the Opera. Back to work, or university after the summer holidays means you might be opening more, and more work-related tabs. But work isn’t everything: many of you like to stay entertained, while working on a presentation, or answering emails. That’s where our video pop out function comes in. Many of you are already familiar with it. The Video pop out, a feature we introduced back in 2016, lets you watch a video, for example on YouTube or Vimeo, in a separate window, “popped out” from the website you are streaming it from. This means you can keep browsing, or working on a report, while not missing on a single frame of the action from your favorite video. Unlike in other browsers, in the Opera this feature works with a single click, and on most websites containing videos. With this version of Opera, we have added an important feature for the video pop out: the volume control. We’ve made it easier for you to mute, or adjust the volume of your videos. A benefit of this is, that you no longer have to find the tab playing the video to do it. You can now adjust the volume from the mini video window you’re watching. The volume control is found at the bottom of the video pop out player. Click the speaker icon to mute, or unmute your video, and click along the volume slider to adjust the volume as needed. Remember, that you can quickly return to the tab hosting the video, without having to find and click on the tab itself. Hover your mouse over the title of the video in the pop out window, and click Back to Tab. To initiate video pop out, start a video from YouTube or Vimeo (or just about from any site), and click the pop out icon at the top-center of the video. A small window will appear. This window can be moved, and adjusted as you please. Some time ago, we introduced the scroll to the top of the page feature, which allows you to instantly scroll to the top of a web page by clicking the active tab. Clicking the tab again will bring you back to where you were on the page. You will find the page zoom level indicator in the combined address and search bar. If you change the zoom level for a particular website, you will see a magnifying glass pop-up informing you about it. You can then change the zoom level by clicking the +/- buttons in the pop-up. If you have set page zoom level to default for all pages, the indicator will not appear in the address bar, until you change the zoom level on one of the pages. You can adjust the page zoom level for all web pages at once by going to Settings > Basic > Appearance > Page zoom. If you have adjusted the zoom level for an individual website, go to Settings > Advanced > Privacy and security > Content settings > Zoom levels to edit your page zoom preferences. We are always happy to get your input, especially on the elements we can improve on. That’s why we have just made it easier for Windows, and Linux users to report any issues, that might arise. To do so, simply click the O-Menu button, and go to Help to find the Report an issue… section. Click on it, to get redirected to the Opera’s bug report wizard. We’ll take it from there. Mac users can find Report an issue… by clicking Help in the toolbar. Our About page provides useful information about your current version of the Opera, as well as system information and installation, profile and cache paths. We have now redesigned it for your convenience. Legal information, including our End User License Agreement, and an updated Privacy Statement and Terms of Service is provided at the bottom of the page. If you wish to check for an available update to your Opera browser, go to Update and Recovery… in the O-Menu for Windows and Linux, and Opera in the toolbar for Mac. In order to provide you with a great, free product, we occasionally suggest sponsored content as Speed Dials, or bookmarks. You can now toggle this feature off in the Advanced section of the settings page. Before you do so, please consider that, as a product delivered to you free of charge, you support Opera by keeping sponsored content switched on. 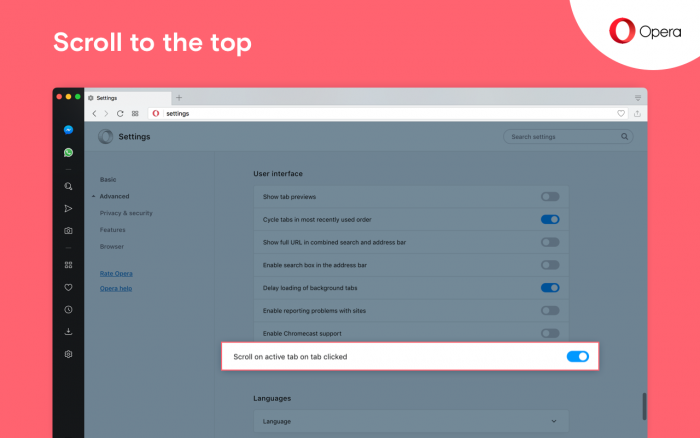 Today, Opera 56 has tidied up the Settings page into four sections: Basic, Privacy and security, Features, and Browser. We hope this new layout will help you more easily navigate around the settings. Basic includes options for: blocking ads, wallpapers, appearances, the sidebar, synchronization, search engines, default browser choices, and on startup options. Privacy and security, Features, and Browser are nested in the Advanced section. You can click Advanced in the left sidebar of the settings, to reveal these three remaining sections. Privacy and security includes preferences for privacy and security, and webRTC. 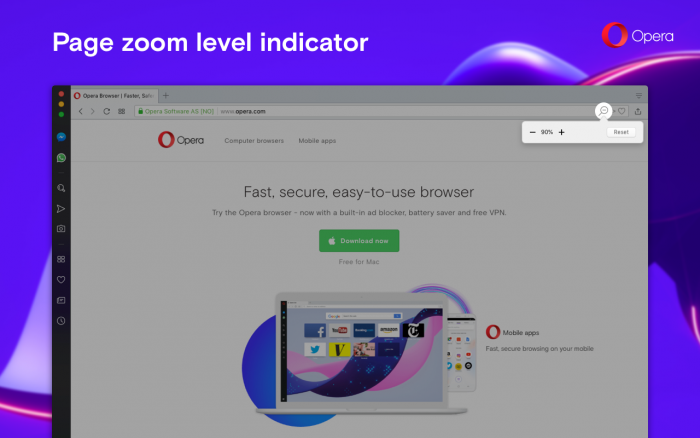 Features includes options for: Opera’s VPN, battery saver, Instant Search, My Flow, search pop-up, video pop out, personal news, and Opera Turbo. Finally, Browser includes options for: start page, user interface, languages, downloads, system, shortcuts, and for reset settings." The Chromium has been updated to version 69.0.3497.100. "It’s weekend, but we decided to not to wait until next week with this release for two big issues on the current stable, affecting macOS users." - DNA-72657 Video content unable to play in macOS Mojave 10.14. - DNA-72672 macOS Mojave h264 videos won't play with disable-gpu switch. - DNA-72799 Crash, when interacting with install extension sliding toolbar. Speed Dial in Omnibox - very nice!!! "We’ve fixed the crash caused by deleted bookmarks, and we stopped the zoom indicator icon from showing on a PDF file opened online (macOS). You’ll also find translations updates here." On extensions manage page - what does "allow on all websites" box mean? Hi @rudrick, it means, that the extension should be allowed to run on all webpages. Hi @rudrick, it seems to be a result of ongoing changes in the Chromium's code, and/or a bug - mentioned on the blog here (also occurs in the latest developer build). So far, I didn't find more related bug report, than 884222, which is already fixed, so there's good chance, that the fix will be merged with one of the upcoming builds. If you want, you can find more related info here, and here. That's OK. I wonder does Opera get new ://extensions page... And ://bookmarks has been in the making for quite some time. - DNA-72189 No hover on bookmarks bar folders. - DNA-72226 [Mac] Blurry zoom indicator with disable-gpu switch. Hi @rudrick, this may be caused by temporary overload of the VPN servers, when a large number of users are using the service at the same time, or for some reasons by limited bandwidth for some countries or regions. If you need faster VPN services, then maybe you may consider to use one of the other, dedicated VPN solutions, offered also free of charge by third parties. - DNA-72827 [Dark mode] Suggestions in Search bar not visible. - DNA-72866 Crash at [ZoomButton isDefaultZoom]. "We added fixes for a crash related to closing browser window, and missing tab separator in Opera for Linux." "We’ve fixed the issue for pressing Cmd+W, which closed Opera instead of closing a tab." "Automatic update to this version will be enabled gradually, more strictly than usually."